Oklahoma City has had a science museum for years. Funded primarily by the Kirkpatrick Foundation, the science museum was part of a complex of museums in northeast Oklahoma City. In the same Kirkpatrick Center were the Air & Space Museum, International Photography Hall of Fame, Red Earth Gallery, Omniplex Science Museum, and several others. 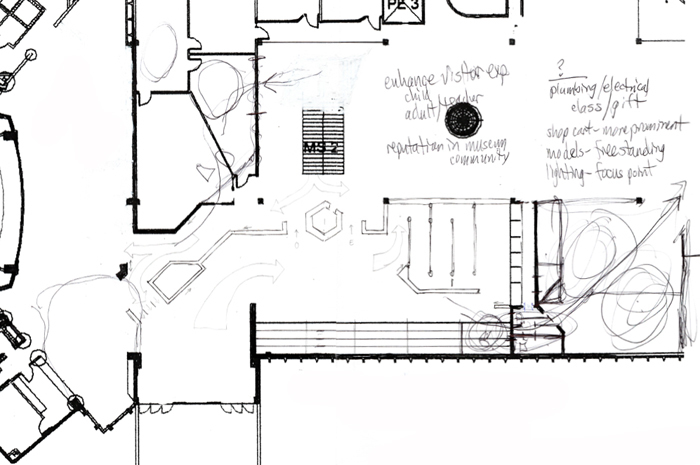 To convey the variety of entities within,most people called the facility the Omniplex. A change of vision and direction dictated that the building would primarily be known as a science museum. 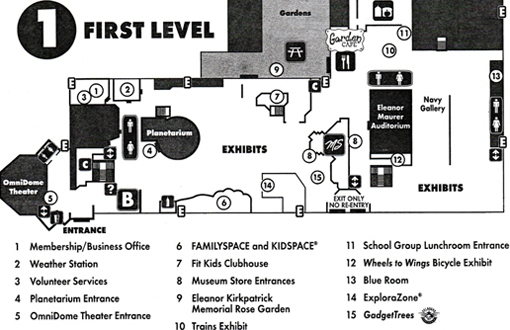 Funnel Design Group was hired to design exhibits, graphics, and promotions. I was hired as a consultant to work with Funnel and proposed the changes detailed below. The board and director of the museum accepted and implemented the new name, the new map style, and the new entryway layout. The museum has also raised funds for a major redesign of the main entrance. The charge from the client was to create a name that had the word science in it. 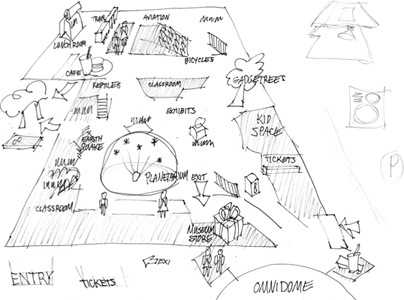 The existing name, Omniplex, was developed to convey the idea of a collection of museums. But there was now a new focus - to position the museum as a science museum. During discussions that gravitated toward the simple name, Oklahoma Museum of Science or Oklahoma Science Museum. In the Olympics of 1984, the USA Team was referred to as Team USA. A simple reversal of components. That same logic could work here. I proposed that the word Science be first and of visual importance: Science Museum Oklahoma. A unique type treatment by a designer at Funnel Design Group for the new identity (on the left) exploited the relationship between the S and E - the word museum is a mirror image ambigram - the left side is a reverse of the right. 1. the colors were black and blue, not great for a museum that strives to entice kids to explore science. 2. there were three different typefaces in the logo. 3. emphasis is on the word museum, rather than science, the most important word. 4. the word museum had two awkward, unnecessary, and inappropriate square dots at each end of the word. I sketched the image above on the right just for the fun of it. I strove to convey a more lively and colorful image, using basic composition and colors to enhance the uniqueness of the letterforms. This provides a balance between the innovative (the type treatment) and the basic primary colors and the justified orderly arrangement of type, to better convey science. The entry at the science museum in Oklahoma City was a bit too chaotic - entering guests intersected with exiting guests, there was little guidance or direction on where to buy tickets and enter, and the movie theater to the left competed for attention with the museum entrance to the right. After observing guest interaction and traffic flow, a new lobby layout was presented. The proposal included adding low walls to segregate entering and exiting traffic and to provide a clear notion on which way to move to the box office and entrance. 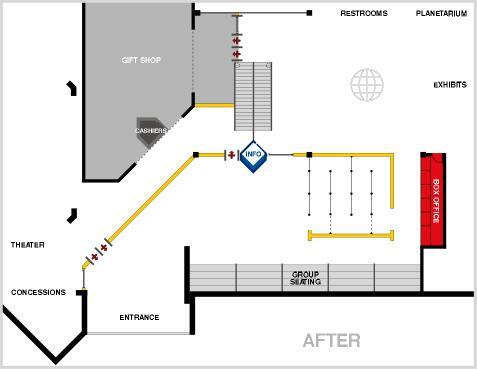 I also proposed that the Gift Shop, Museum Store, be moved from the interior of the museum to the exit/entry foyer. Some former classrooms could swap with the store. Encouraging or requiring guests to exit through a gift shop is used at many amusement parks and other museums. 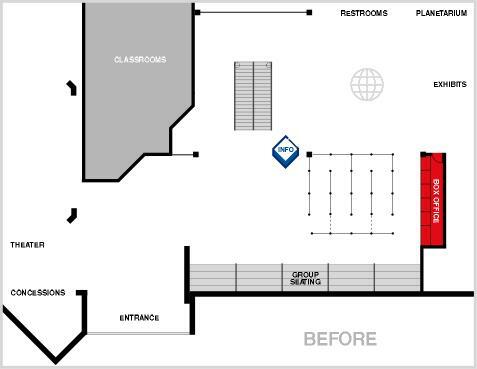 Not sure they would go for such a drastic change, we positioned the gift shop relocation in the 3rd option - the ultimate plan. To our delight, the museum loved the idea. The new exit traffic pattern, going through the gift shop, resulted in a doubling of sales of souvenirs. The director wanted to disguise or hide a plain concrete wall exterior that ran the entire length of the building, except for a portico and glass foyer. But to implement any treatment to the walls would likely draw attention to them. A better option is to enhance the entrance to become a dominant focal point. Then, the concrete wall becomes very secondary and can more easily be ignored. The existing map was a standard graphic top view map. 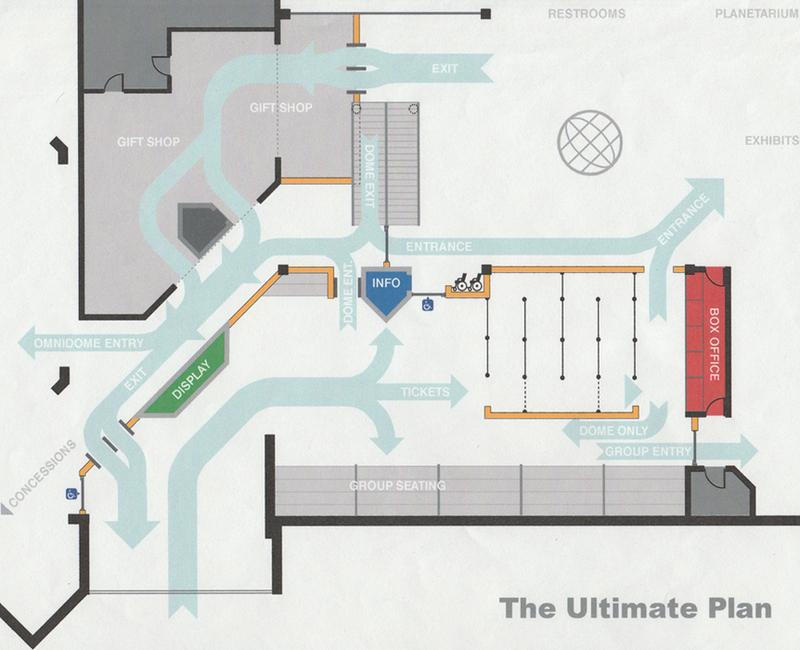 I wanted the map to convey the objectives of the museum a bit better - more human, more fun, and more intriguing. 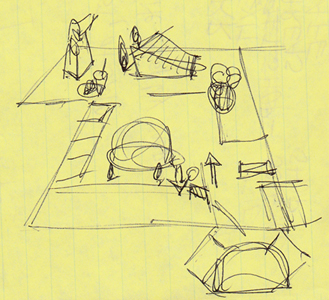 The above rough sketch of the proposed map is in a perspective view and hand illustrated to help it relate better to the museum. Recognizable icons represent the major areas. By labeling the attractions on the map, there was no need for a legend.